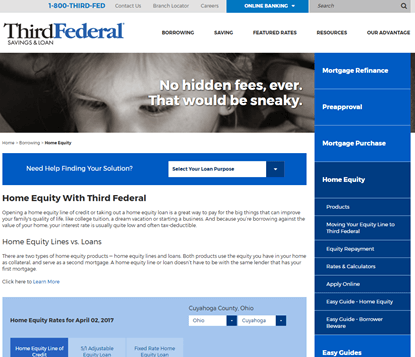 Third Federal doesn’t offer rate locks for home equity lines of credit and has one of the lowest maximums out of all the lenders we reviewed. The interest rates they offer are very low, however, so if you live in a state Third Federal operates in then you should consider looking into them for your home equity loan or line of credit. Third Federal offers some of the lowest interest rates we could find. No fixed rate or rate lock for home equity lines of credit. 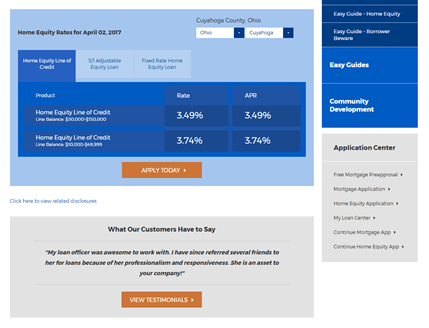 Third Federal has some of the best interest rates out of all the home equity loan and home equity line of credit providers that we looked into. However, you have to use your primary residence as collateral against the loan, not a second home or rental property, and the maximum loan amount is lower than most of the lenders we looked into. However, their rates are so good that they are still worth checking out if you live in a state where Third Federal offers home equity loans and lines of credit. The rates for loans from Third Federal are among the lowest we could find. This makes them an incredibly attractive option if you are most concerned with the financial implications of a home equity loan. However, some of their products have maintance fees and other charges that can wind up costing you money down the line. The best strategy is to consult with your loan officer to determine which of their products is right for your specific needs. Another place where Third Federal stands out is the fact that they are more willing to work with customers who have a less than stellar credit history than other companies are. This is especially true for individuals who have a higher than average debt to income ratio. However, this is offset slightly by the fact that you need to use your primary residence as collateral against the loan, which limits the options some customers have and can potentially affect their interest rates. Even considering this, the rates at Third Federal are low enough to make them a good place to start looking for a home equity loan or line of credit. Third Federal is standard in the industry in that they offer home equity loans with a payback period of up to 30 years. Customers should be sure to investigate the draw period if they are looking for a home equity line of credit, but should beware that there isn’t a way to lock in the rate for a line of credit. However, the rates won’t get higher than 18% or lower than 2%. Third Federal has good customer service, and customers have reported a generally positive experience working with them. Their website has a number of tools to help you understand your needs and how much your loan will eventually cost you. Their email process is especially simple, and we were able to get answers to emailed questions at a very quick pace, which makes them an appealing option for people who are busy during the day and can’t spend much time on the phone figuring out their home equity loan options. The home equity loans and lines of credit offered by Third Federal are some of the cheapest on the market. Their customer service is adequate, but the fact that you can’t use a second home as collateral against your loan means that some customers will want to look elsewhere. The same is true of their home equity lines of credit, which will work well for some customers, but others may balk at the variable rate.